The E1 Elliptical Cross-Trainer offers a low-impact, total-body workout for home exercisers of all fitness levels. natural motions with outstanding durability and extremely quiet operation. Maintenance-free ball bearings reduce friction and ensure nearly silent operation, which is ideal for home use. Fitbit® by enabling proximity login on the LFconnect app. Or, connect to interactive apps like RunSocial for an engaging workout experience. Placed at eye level for an ideal viewing experience. The compression rack securely holds all smartphones and tablets, even those with a protective case. 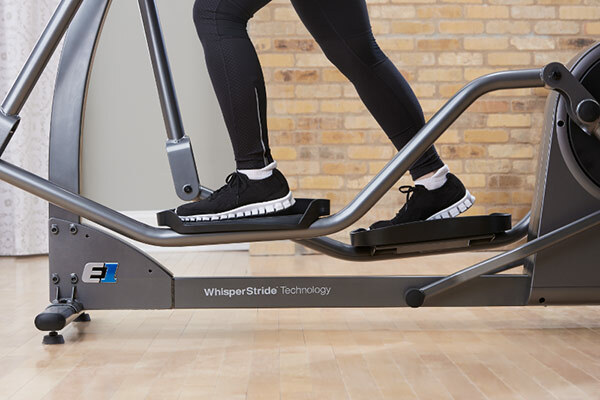 The lower half of the console offers convenient workout setup and in-workout control. It features capacitive touch keys that illuminate when usable and dim when not in use. and in the best health clubs around the world. state-of-the-art technology, attention to design, and extreme durability that has made Life Fitness the No. 1 brand of fitness equipment in the world. cardio and strength equipment that’s built not only for elite athletes, but for exercisers of all abilities and fitness levels. Order your Life Fitness E1 Elliptical Cross Trainer with Track Connect Console from FitnessZone.com today!